The best toaster oven for your household may be different than what your neighbor might choose, but that's okay. You want to choose the one that works best for you and your family. Toaster ovens are perfect for those small jobs when you don't want to use the oven. They can save you money by using less energy and they can keep your kitchen cooler in the summer than firing up your large oven. The question you must ask yourself is do you really need a toaster oven? If you are just going to be toasting things, a toaster is smaller and faster. However, if you also need it to reheat food, bake small quantities of something and so on, a toaster oven may be exactly what you need. Figure out how you want to use the toaster oven so you can plan on a model that will suit your needs. Since toaster ovens are not all made equal, this is a very important part of the purchase. You don't want to waste your money on an oven that isn't adequate for what you need it to do. Toaster ovens come in many different sizes. Measure your countertop so you get one that fits the space you have available. You want to leave room between the unit and the wall to allow for ventilation. The best toaster oven will fit where it needs to go, cook what it needs to cook and fit your budget. Some toaster ovens have more safety features than others. The best toaster ovens will have features like an exterior wall that stays cool to the touch during operation and an automatic shut off to prevent overheating. Most toaster ovens will have a bell go off when the timer goes off. Check out the construction of any model you are seriously considering. The door, hinges, handles and walls should all be constructed of strong materials. If the handle falls off, it will be difficult to open the door. If the hinges fail, you'll end up buying a new oven. Smaller toaster ovens are not as powerful as the larger ones. If you're just reheating leftovers for yourself, you won't need as powerful a unit as if you are cooking for several people on a routine basis. Make sure you get one that meets your needs. 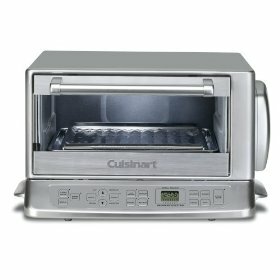 Unless you are planning on roasting in your toaster oven or broiling meat, you may not need a convection toaster oven. The convection variety may cost more because it has a fan system in place that circulates the heat within the oven. Some people are a little leery of paying more just for a fan in the oven, but depending on what you plan to cook, you may actually need it. What kind of look are you going for in your kitchen? Some toaster ovens are stainless steel, some have a retro look and some come in colors. What kind of a space do you have? You can get a low, rectangular oven or a taller, square oven that may come with two racks rather than just one. Once you've decided how large the oven needs to be and how much power you'll need, you can start considering what extra features will be included in the best toaster oven for you. Is it easy to clean? You can't just dunk it into the sink when it gets dirty. Do you like preset functions? These can make it easier to make pizza, pastries and more by just pushing a button. Do you prefer a digital display or an analog display? Do your homework. Ask your friends and family what models have worked well for them. Read reviews to help you find the best toaster oven for your needs. Find one that will meet your needs within your budget.